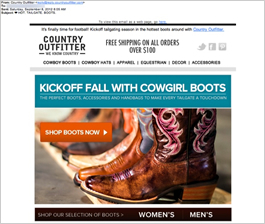 Country Outfitter Email: Does It Make You Want to Kick Up Your Heels in New Cowboy Boots? Country Outfitter (http://www.countryoutfitter.com/) is a web-based retail store that sells a vast selection of cowboy boots and western apparel. Launched in 2011, Country Outfitter already has well over 3.6 million likes on Facebook, thanks to an apparently successful campaign of boot giveaway contests. Subject Line — Does It Intrigue or Look Like Spam? Symbols such as airplanes and stars seem to be popping up all over in subject lines. Do they work to drive opens for certain populations of email subscribers? It’s something that may be worth testing. 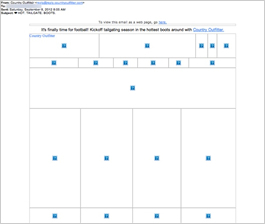 If you’ve experimented with symbols in your subject lines, please share your findings with us. The preview pane without images is not very effective. A good tie-in to the headline is provided — “It’s finally time for football! Kick off tailgating season in the hottest boots around with Country Outfitter.” Plus, a link to a web version of the email is also included. Alternate text with an offer or call to action, however, would provide more incentive for subscribers to download the images in the email. The call to action is simple but strong, “Shop Boots Now.” Plus, the orange call-to-action button located in the top fold stands out. This email was sent in early fall, and the main purpose seemed to be getting people excited about transitioning from summer footwear to fall footwear. Although that may be the case, there’s no sense of urgency created to encourage people to make a purchase. Some sort of incentive, such as free shipping for a limited time or a discount for the first 100 people who made a purchase, for example, may have helped drive more click throughs and conversions. The high quality of the photography and design of this email, along with the reputable brands, contribute to a high credibility for Country Outfitter.